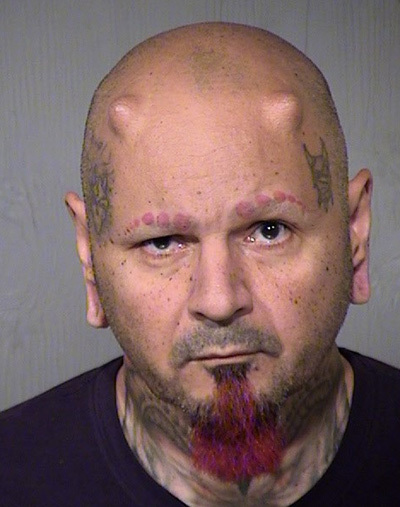 A horned Arizona man is facing a felony assault charge for allegedly slashing his wife with an eight-inch knife after he accused her of infidelity during an argument Sunday. According to Glendale police, Juan Vargas Rodriguez, 53, began quarreling with his wife when she returned home from work. At one point, cops say, Rodriguez demanded that his spouse sleep in a closet. When the woman rejected that request, Rodriguez allegedly responded by pulling out a knife and threatening her life. Rodriguez then slashed the victim in the left arm and left breast, investigators charge. The woman also sustained cuts on a hand when she tried to wrestle the knife from Rodriguez. The attack ended when Rodriguez’s adult daughter disarmed him and separated her father from the screaming victim. During police questioning, Rodriguez claimed not to recall details of the confrontation, saying he “kind of blacked out with rage.” The victim was not seriously injured during the attack. Rodriguez was arrested for aggravated assault and booked into the Maricopa County jail, where the above mug shot was taken. In addition to his subdermal implant horns, Rodriguez appears to have replaced his eyebrows with a series of tattooed dots. Rodriguez is scheduled for a June 6 Superior Court appearance. 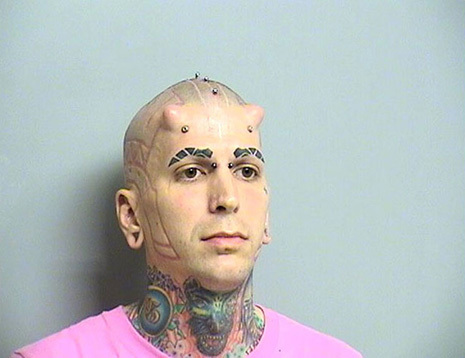 In July 2000, a horned Oklahoma man was arrested for allegedly trying to run down his landlord with a car. But the felony assault charge against Jesse Thornhill, seen below, was later dropped when the alleged victim testified that the incident was just a misunderstanding.